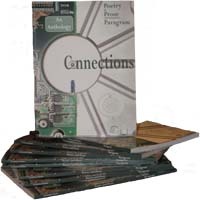 The long awaited second Paragram anthology of poetry and prose has arrived – ‘Connections’ is published! Paragram, a group of authors offering opportunities for publication and performance to new writers, successfully launched and performed work from the first anthology ‘A Toe in the Water’ in November 2011 – it’s hard to believe it was a year ago. Following this we decided to branch out in 2012 and hold an open submission for the second book. Peter Branson (Making Friends); Claire Brook (Facebook); Cathy Bryant (Passing On); Richard Burnett-Carter (Conspiracy); Ian Colville (Celtic Connections); Sandra Curtin (Nitty Gritty, Crying); Judy Darley (Space/invaders, Draughts);Rose Drew (On Examining, The Dancer); Greg Freeman (Backroom Boys); Geoffrey Heptonstall (An Actor Prepares); David Hicklenton (Climate Change); Angela Wye (Notation); Bett Hobbs (The Party, Tai Chi); Jenny Hockey (Past Continuous); Saul Hughes (Verticality, Lost Music); Bibi Jacob (Marble Memories); Sue Judd (Into The Past);David Mellor (Street Scene); Ian Mullins (Decisions, Decisions, Long Gone); Adam Napier (Head and Hand and Heart); Linda Nathaniel (Fingertips); Clodagh O’ Brien (Hillview); Carl Palmer (Blind Trust);Kauser Parveen (The Graveside); Annie Roberts (Lost Connection); Jonathan Rodgers (Entropy); Gill Shutt (Ain’t Life Grand);John Stocks (St Pancras, Come to Me); Thomas Thurman (Coincidence); David Trame (A Stare Beyond Fading);Vivienne Vermes (Mind the Gap); David Whippman (Perhaps); B A Bickerton (A Familiar Voice); Maroula Blades (What’s It All for? ); Peter Cooper (Leaving Gift); Rory Duffy (But); Angela Higson (Change of Address); Helen MacKinven ( Button Box); David McVey (Coffee and Silence); Lynda Murphy (Take Me Home); Jasmine Palmer (Finger Grip); Jaqueline Pye (Sandcastle); Jeremy Tiang (The Word For Water); Stella Turner (Tat); Alison Williams (For Amelie). ‘Connections’ also included writing by founder Paragrammers Sally J Blackmore, Andrew Lunn, Kate O’ Brien, Jill Taylor and Lesley Whayman. The official launch will be in early 2013. We have approached The Poetry Cafe as a venue as it is easy to reach, in Betterton Street, Covent Garden, as well as appropriate for out event, being the home of The Poetry Society. Many of you are already enjoying seeing your work in print as we have sent out all the pre-ordered books. If you missed the chance to take up the offer at the pre-publication price, and as Christmas is close and I just know the book will make a perfect gift, we are extending the special price offer to anyone who orders before 15th December 2012. Payment by PayPal on receipt of invoice which will include P&P at cost and by Royal Mail second class post. I will send the invoice on receipt of the email.